Whatever we purchase, we have a never ending zeal to get some discount. If the seller gives us a discount we feel delighted and we purchase goods from him again. For this reason, many sellers give discounts to customers to increase their sales. There are two types of discounts according to the reason they are given, They are Cash Discount and Trade Discount. 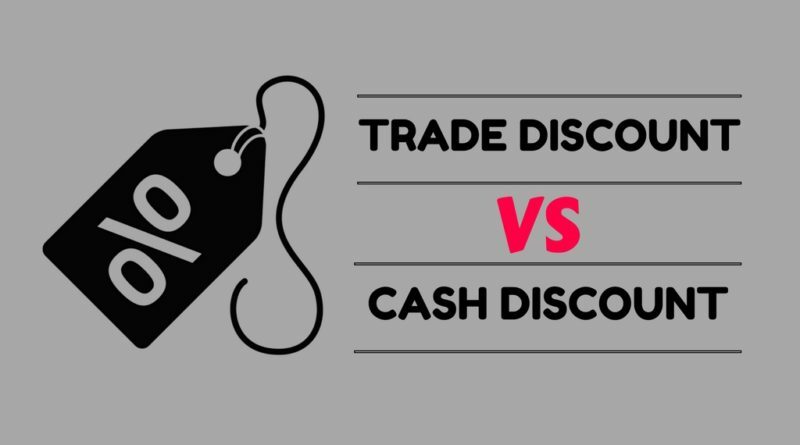 This article concentrates on differentiating the Trade Discount and Cash Discount. Trade discount is defined as a discount allowed on the list price of the goods. It is given by producer to the wholesaler or by a wholesaler to the retailer for encouraging the retailer to purchase goods in large quantity. Trade discount is usually given to customers to retain the customers for a long term and the discount given is shown in the invoice and the trade discount given is not recorded in accounting records at all. A purchased goods of list price Rs. 8,000 at 15% trade discount from X. In this case, seller allowed discount to the buyer to encourage him to make more purchases. Cash discount is defined as a reduction in price which is allowed by the seller to the buyer to encourage him to make payment in cash at the earliest possible. It is treated as a Nominal Account transaction. The cash discount given is recorded in the accounting books. The person who allows a discount, consider it as an expense and records it under debit section as’Discount allowed’. The person who received the discount, consider it as an income and records it under credit section as ‘Discount Received’. Mr.John owes Rs. 10,000 to Mr. Carl. He pays Rs. 9,500 in full settlement against the amount due. In this case, Mr.Carl allowed a discount of Rs.500 to Mr.John to encourage him to pay the due early. Trade Discount is the concession given by the buyer to the seller if he purchases goods in large quantity. Cash Discount is the concession given by the buyer to the seller if he made payment before the due date. Trade Discount is also called as a strategy used by the sellers to promote sales of goods. Cash Discount is a strategy used by the sellers to encourage early cash payments from buyers. The trade discount allowed is not recorded in the accounting books of the firm. The cash discount allowed is recorded in the account books of the firm. Trade Discount is offered when the customer purchases goods from the seller. Cash Discount is offered to the buyer when making a payment before due date. Trade Discount given to customers is treated as a foregoing of some percent of profit for getting more sales. Cash discount given to debtors is always a loss and is shown as expenditure in the Profit and Loss Account. There is no such concept of provision for cash discounts. Cash Discount is given according to the relationship between seller and buyer. There is a concept called 'Provision for discount on debtors' which is deducted from the profits of business every year. From the above discussion, it is evident that both Trade Discount and Cash Discount are the tools used by the business organizations to promote their product sales and also to encourage the debtors to make payments within the due date of payment by giving a certain percent of discount on the payable amount. Anyway, these are the most familiar and widely used methods for every business to increase their business and also for maintaining a good relationship with their customers.